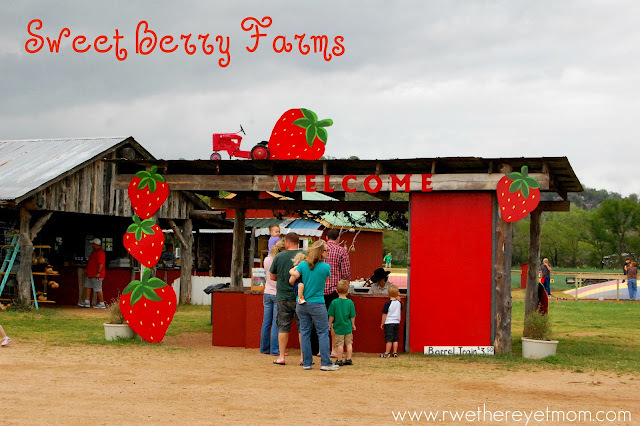 Sweet Berry Farm ~ Marble Falls, Texas - R We There Yet Mom? 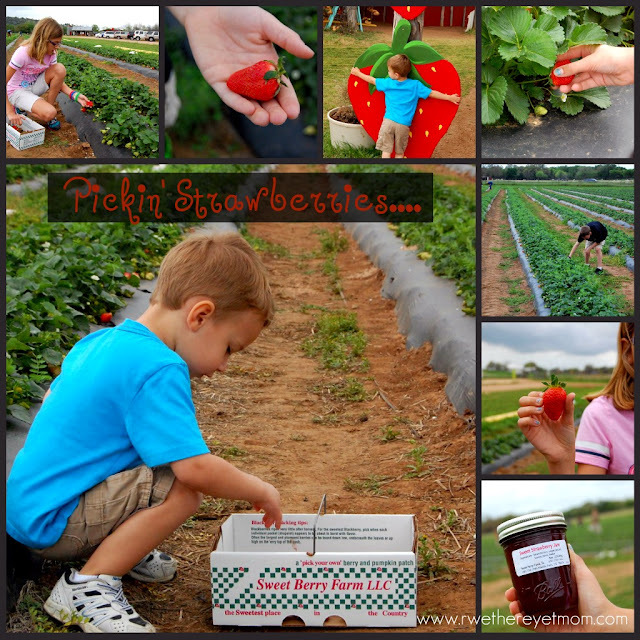 It’s harvest time at Sweet Berry Farm! And right now, pick all the strawberries you want! 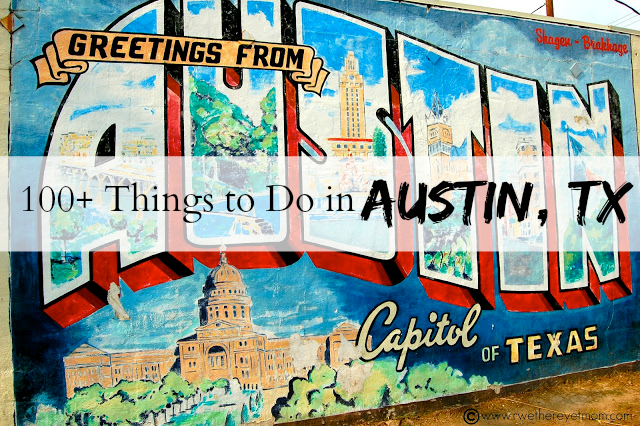 This Spring is offering some gorgeous days to head to the farm – there is so much to do! Grab a box when you first get there – no need to bring one from home – and as the farmers advise, start in the middle of the row, picking the “redder the better” strawberries. Strawberries do not ripen much once they have been picked. Also, most people tend to start at an end and have a full container by the time they get the biggest ones in the middle of the row. We headed out on a Saturday in March and it was busy at 10 am. But never too busy where we felt crowded or that there wasn’t enough strawberries to pick. In fact, with the Spring rain we have been receiving, there is a great crop to pick right now. And what I love most about the Sweet Berry Farms website is the daily updates on what’s happening at the farm. Check this page before you go to know if the strawberries are plentiful and hear what other events are going on. 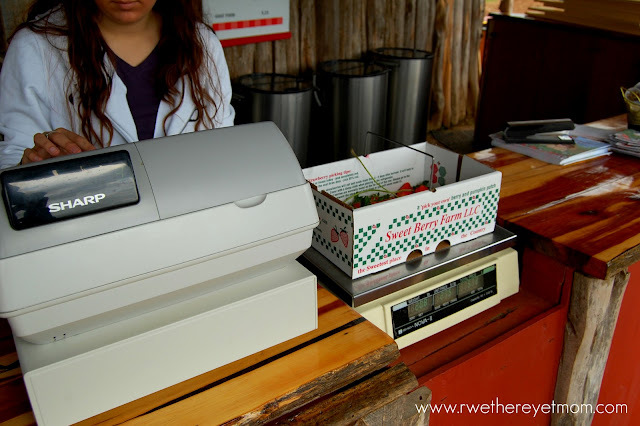 Once you have completed picking, they will weigh your bounty and pay per pound. We had a box that was maybe a third full and we had a TON of strawberries to enjoy all week on ice cream, on cereal, with yogurt……. A full box will cost you @$15 – a bargain for fresh picked strawberries! Sweet Berry Farm provides lots of fun activities in the Spring for all ages. 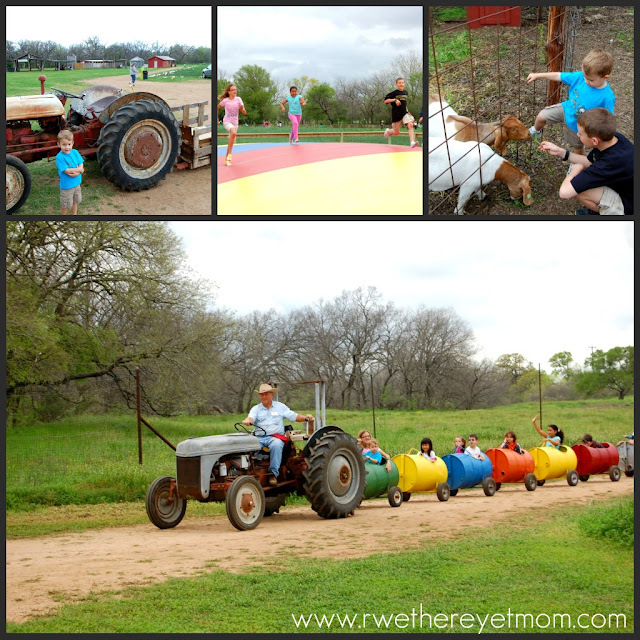 My older kids enjoyed bouncing on the Harvest Hopper, while my toddler loved the barrel train. Additionally, there are goats to feed, berry ice cream to try (strawberry/blackberry was YUMMY!) , and jellies/jams to purchase. From now through April, Strawberries are for picking, but come May – June, the crop is blackberries. According to the farm, you can also pick onions, potatoes, and possibly tomatoes come May & June. And I am highly anticipating the Texas Maze which opens up in June as well. Sweet Berry Farm is also a popular destination in the Fall with pick your own pumpkins and gourds, hayrides, scarecrow stuffing and more. What we liked best about Sweet Berry Farm is the relaxing atmosphere. We took our time meandering around the farm, taking pictures, and enjoying being outdoors. This is not just a one-time experience. I can see us visiting often. Especially to see that Texas maze…..
We did this last year, and the year before for raspberries. It is so much fun, and an excellent experience for kids. They love it! I just wish our would get a cool tractor ride like the one you saw. That looks like so much fun – I love fresh strawberries! Unfortunately, up here we have to wait until June for them. We’ve gone there to pick blackberries in summer and pet the goats – a rustic place to take a picnic and the berries are divine! This is less than a mile from my parents’ house. I love driving by there and seeing what’s going on depending on the season. Strawberry season is my favorite because they’re so dang delicious.